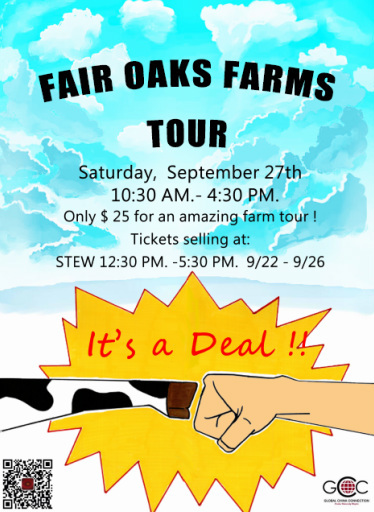 Fair Oaks Farm is what people most proud of and the largest Indiana’s milk base. It is a country with acres of great fun, food and learning where you can explore family farms and reconnect with nature, animals and our planet. Fair Oaks Farm is not only committed to educating the public about the importance of modern agriculture, but also committed to protecting the environment, caring for animals, as well as ensure the highest quality products. 1. Event will be on September 27th, GCC officers will organize transportation and accompany with students during the trip as well as provide a pleasant journey for students. 2. We will have the opportunity to visit the Birthing Barn and witness the miracle of life. 3. We will also have the opportunity to taste the most pure fresh dairy products, including delicious and low-fat ice cream and cheese. 4. Learn the daily life of the animals. 5. Fair Oaks Farm expands their horizons and open the public museums and fantasy stimulation 4D movie. 6. More joys are waiting for you to experience.